You can enable your users to self-manage their own multi-factor authentication (MFA) devices and credentials on the My Security Credentials page. You can use the AWS Management Console to configure credentials (access keys, passwords, signing certificates, and SSH public keys) and MFA devices for your users. This is useful for a small number of users. But that task could quickly become time consuming as the number of users grows. Security best practices specify that users should regularly change their passwords and rotate their access keys. They should also delete or deactivate credentials that are not needed. We also highly recommend that they use MFA for sensitive operations. This tutorial shows you how to enable these best practices without burdening your administrators. This tutorial shows how to allow users to access AWS services, but only when they sign in with MFA. If they are not signed in with an MFA device, then users cannot access other services. This workflow has three basic steps. Create a group whose members have full access to all Amazon EC2 actions if they sign in with MFA. To create such a group, you attach both the AWS managed policy called AmazonEC2FullAccess and the customer managed policy you created in the first step. Sign in as the test user to verify that access to Amazon EC2 is blocked until the user creates an MFA device and then signs in using that device. An AWS account that you can sign in to as an IAM user with administrative permissions. Your account ID number, which you type into the policy in Step 1. To find your account ID number, on the navigation bar at the top of the page, choose Support and then choose Support Center. You can find your account ID under this page's Support menu. A virtual (software-based) MFA device, U2F security key, or hardware-based MFA device. MFAUser Choose only the option for AWS Management Console access, and assign a password. EC2MFA MFAUser Do NOT attach any policies or otherwise grant permissions to this group. You begin by creating an IAM customer managed policy that denies all permissions except those required for IAM users to manage their own credentials and MFA devices. 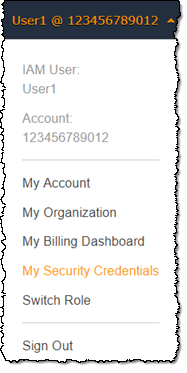 Sign in to the AWS Management Console as a user with administrator credentials. To adhere to IAM best practices, don’t sign in with your AWS account root user credentials. For more information, see Create individual IAM users. Choose the JSON tab and copy the text from the following JSON policy document: AWS: Allows MFA-Authenticated IAM Users to Manage Their Own Credentials on the My Security Credentials Page. Paste the policy text into the JSON text box, then choose Review policy. The Policy Validator reports any syntax errors. You can switch between the Visual editor and JSON tabs any time. However, the policy above includes the NotAction element, which is not supported in the visual editor. For this policy, you will see a notification on the Visual editor tab. Return to the JSON tab to continue working with this policy. On the Review page, type Force_MFA for the policy name. For the policy description, type This policy allows users to manage their own passwords and MFA devices but nothing else unless they authenticate with MFA. Review the policy Summary to see the permissions granted by your policy, and then choose Create policy to save your work. The new policy appears in the list of managed policies and is ready to attach. Next you attach two policies to the test IAM group, which will be used to grant the MFA-protected permissions. In the search box, type EC2MFA, and then choose the group name (not the check box) in the list. On the Permissions tab, and click Attach Policy. On the Attach Policy page, in the search box, type EC2Full and then select the check box next to AmazonEC2FullAccess in the list. Don't save your changes yet. In the search box, type Force, and then select the check box next to Force_MFA in the list. In this part of the tutorial, you sign in as the test user and verify that the policy works as intended. Choose EC2 to open the Amazon EC2 console and verify that the user has no permissions to do anything. In the navigation bar on the upper right, choose the MFAUser user name, and then choose My Security Credentials. Now add an MFA device. In the Multi-factor Authentication (MFA) section, choose Assign MFA device. You might receive an error that you are not authorized to perform iam:DeleteVirtualMFADevice. This could happen if someone previously began assigning a virtual MFA device to this user and cancelled the process. To continue, you or another administrator must delete the user's existing MFA device. For more information, see I am not authorized to perform: iam:DeleteVirtualMFADevice. For this tutorial, we use a virtual (software-based) MFA device, such as the Google Authenticator app on a mobile phone. Choose Virtual MFA device, and then click Continue. IAM generates and displays configuration information for the virtual MFA device, including a QR code graphic. The graphic is a representation of the secret configuration key that is available for manual entry on devices that do not support QR codes. Open your virtual MFA app. (For a list of apps that you can use for hosting virtual MFA devices, see Virtual MFA Applications.) If the virtual MFA app supports multiple accounts (multiple virtual MFA devices), choose the option to create a new account (a new virtual MFA device). From the wizard, choose Show QR code. Then use the app to scan the QR code. For example, you might choose the camera icon or choose an option similar to Scan code, and then use the device's camera to scan the code. In the Manage MFA Device wizard, choose Show secret key, and then type the secret key into your MFA app. When you are finished, the virtual MFA device starts generating one-time passwords. In the Manage MFA Device wizard, in the MFA Code 1 box, type the one-time password that currently appears in the virtual MFA device. Wait up to 30 seconds for the device to generate a new one-time password. Then type the second one-time password into the MFA Code 2 box. Choose Assign MFA. Submit your request immediately after generating the codes. If you generate the codes and then wait too long to submit the request, the MFA device is successfully associated with the user. However, the MFA device is out of sync. This happens because time-based one-time passwords (TOTP) expire after a short period of time. If this happens, you can resync the device. The virtual MFA device is now ready to use with AWS. Sign out of the console and then sign in as MFAUser again. This time AWS prompts you for an MFA code from your phone. When you get it, type the code in the box and then choose Submit. Choose EC2 to open the Amazon EC2 console again. Note that this time you can see all the information and perform any actions you want. If you go to any other console as this user, you see access denied messages because the policies in this tutorial grant access only to Amazon EC2.